Everyone in health and fitness eventually hits the same wall: Time. Specifically, they run out of it. They start feeling like there aren’t enough hours to coach clients, manage their businesses, and keep an eye on growth. How do top coaches save time, increase their effectiveness, and work on their own terms? With very specific strategies. In this article, I’ll cover those strategies. I’ll also share one of the tools that’s helping thousands of coaches change the game in terms of time management and work flexibility. Today’s article is really exciting because I’m going to cover something that every single person working in health and fitness (or who wants to work in health and fitness) needs to know. Take stock of what you spend time on in your business. Weed out low-value, annoying activities. Increase the time you spend on lucrative and fulfilling tasks. And, in doing so, I’ll show you how you can coach more clients, more effectively; make more money; and have more time off. Before digging in, however, I wanted to let you know that the ultimate coaching time-saver — Precision Nutrition’s ProCoach — is opening up very soon. Tested with over 100,000 clients, ProCoach makes it easy to deliver world-class, proven nutrition and lifestyle coaching to your own clients. It’ll help you grow your business while working less, getting better results, and living life on your own terms. Want to coach in-person? Online? Or a combination of the two? Whatever fits your ideal lifestyle, it’s all possible with ProCoach. To understand ProCoach you first need to understand why it was created, and the key problems it helps health and fitness professionals overcome. John Berardi shares his early coaching struggles and how PN went from 20 to over 100,000 clients with ProCoach. Want to know exactly how ProCoach works? Then check this out. See how other health and fitness pros are using ProCoach with their clients. In summary, ProCoach delivers — to your clients, on your behalf — a total coaching solution, complete with daily lessons, habits, check-ins, and more. Plus, as their coach, you’ll support your clients by answering questions, offering encouragement, and tracking progress through special ProCoach software. The good news? On Wednesday, June 5th, we’ll be opening ProCoach to our PN Certification students and graduates around the world. For now though, if you’re ready to start saving time, increasing your effectiveness, and working on your own terms, read on. If you’ve thought this, you’re definitely not alone. In fact, you share the same problem as most of the driven, ambitious, successful people I know: At a certain point, you reach capacity. On the one hand, that’s great news. Whatever you’re doing is working. You’re in demand. People want to coach with you. More people than you can handle. On the other, you’re maxed. You can’t find a way to enroll more clients, make more money, or just take a vacation without magically adding hours to the day. Of course, some of you might have the opposite problem. You might be new to the field, excited to grow your business, and enthusiastic about getting more clients… yet you don’t feel like you have the time, energy, or resources to create and market an offering to get people in the door. Your problem isn’t actually time. It’s strategy. To take on more clients and make more money — all while delivering world-class results and living the healthy, flexible, passionate life you envisioned — you have to be more strategic. In other words, there is a way to magically add hours to your day. To get those hours, though, you have to learn and fully adopt certain techniques that radically decrease the time you spend on lower-value tasks. Only then can you transfer that “extra” time to much higher-value (and more lucrative) tasks. I know, I know. When in the depths of “time depression” it can feel like no matter how much you want to power through responsibilities, there are always three sets of 10,000 other things to do. More emails, more sessions, and, yeah, your website could use an update. It can seem like there’s no rope to help you climb over that no-time wall. All you can do is bang your head against it, hoping to one day break through. Trust me, I had the same problem as you. Before Precision Nutrition was born, I was a health and fitness coach running my own personal training business in Miami, Florida. Spending 45-60 hours a week training clients on the gym floor. Spending another 15-20 hours a week doing things like program writing, nutrition plan development, record keeping, billing, and sales. Arranging my schedule around the training availability of clients, i.e. working both early mornings and evenings, plus weekends. Finding that despite how hard I worked, I couldn’t get past a certain cap on how many clients I could coach or how much money I could make. This went for a few years. I was first frustrated. Then mad. Then I decided to figure it out. Our 20-person PN coaching team works with about 5,000 clients a year. At any given time, each coach works with around 300 people. Even better? They do it virtually, from wherever in the world they like. One of our coaches just spent another winter working with her clients from sunny Costa Rica, surfing in the morning, coaching online in the afternoon. Another is a dad of four children and he coaches around drop-offs and pick-ups, which he does himself every day. The best part? Even with this amazing flexibility and 10x increase in client:coach ratio, we’re still getting consistently jaw-dropping results like these. Jill: Age 25, lost 55 pounds. 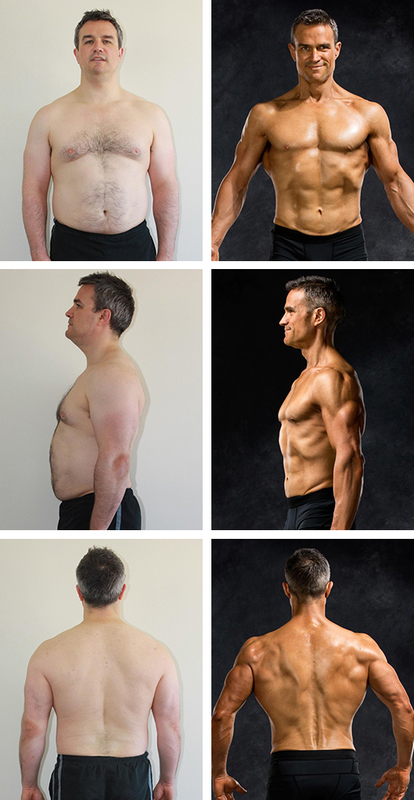 Andrew: Age 43, lost 51 pounds. Kenneth: Age 35, lost 21 pounds. Cindy: Age 50, lost 70 pounds. Michelle: Age 44, lost 35 pounds. Aaron: Age 37, lost 50 pounds. Colin: Age 45, lost 24 pounds. Jenny: Age 28, lost 38 pounds. So how does one go from maxed-out and burned-out with 20 clients to coaching 300 clients, making more money, living a more flexible life? By changing how you think about time management. It all started back in the mid 2000s when I met a systems design engineer named Phil Caravaggio. Phil was accustomed to looking at companies outside fitness — like IBM, Dell, Apple — to see how they used systems to simplify or amplify their businesses. He taught me that “being busy” is never the real problem. Instead, the problem is how we think about productivity and effectiveness. We’re told that, to be more “productive”, we have to work hard and hustle more. We’re told that, to fit more into each day, we have to use so-called productivity hacks and juggle everything that comes at us. This approach is fundamentally flawed; it really just asks us to do more without showing us how to do more of the right things, less of the wrong things. It makes me exhausted just thinking about it. a million cobbled together “productivity hacks” that are supposed to make you more efficient but actually just make your brain hurt. *Unique abilities are the things that a) you’re uniquely good at, b) you enjoy doing, and c) make a real impact on your business. Back in the day, we needed a system. And so do you. First, figuring out which tasks were low-value and repeatable. Next, automating and personalizing the stuff that was repeatable. Finally, spending our newfound hours on higher-value tasks. Want to know exactly how we did it? Here’s the 4-step formula we originally developed to coach more people to better results in less time. (It’s also the formula that underpins ProCoach, which you can use in your business too). Take a look at where you’re spending your time. …plus an additional 15-20 hours a week on business management tasks like record keeping, program writing, lead nurturing, marketing, and on-the-fly lifestyle coaching. I got a ton of fulfillment coaching clients through times when they felt overwhelmed, incapable, or stuck — in fact, in those areas, I felt irreplaceable. Frankly, everything else I did in my business seemed like a time waster. So I got real with exactly what I was spending my time on. Spend a couple weeks documenting where every minute of your workday is going and how those minutes make you feel. Time wasters are the tasks that make you mad and never go away; the stuff that makes you dread getting up in the morning. For me, it was the stuff that seemed like “busywork” — invoicing, counting clients’ reps, answering basic questions about protein and peanut butter. Remember: Your “time wasters” might be different from mine. Everyone’s unique abilities and business goals are different. Time warriors are the tasks you do for your business that you love, that you feel have a tangible impact on your income, and that you know you’re uniquely suited for. What do your clients 100% depend on your for? What do you do that makes them so excited and brag to their friends? What are the special things that only YOU can give them? Again, the answer will depend on your particular strengths and business goals. Maybe you have an impressive grasp on nutrition coaching? Or marketing? Or you’re a work-from-home mom who can crush it helping new mothers maintain a fit life after kids. Automate every “time waster” you can. Your goal is to spend significantly less time on tasks you dislike and that don’t particularly support client results or business growth. Ask yourself: Am I reinventing the wheel every time I write a workout program or answer an email about peanut butter? Think about it: Much of your job as a coach is made up of work that you repeat over and over and over. Help clients define and commit to health and fitness goals. Design workout and nutrition plans for people who have common goals. Check in on client adherence and provide accountability. Create and distribute marketing materials for their business. Have you ever noticed that clients all seem to have the same questions? Can you even count the number of times you’ve typed the same eating suggestions? Or how many times you’ve sent a passionate plea to keep going? The truth is, you’re providing the same basic information again and again (and again and again), slightly adjusted for each individual. Now imagine being able to automate 90 percent of work involved in your “time-wasting” tasks. If you’ve been in coaching long enough you’ll realize that the arc of a client typically follows a particular pattern: You have to pass along certain info at certain times, you have to take measurements at particular benchmark moments to track progress, and so on. So take your list of repeated/repeatable “time wasters”, and complete (and — this is crucial — save) the work in one fell swoop. 1. Create your “General” file. requests and guidance for data like weight, measurements, etc. Once you have your categories, write (or paste in from emails you’ve already written) the messages themselves. Depending on the nature of your business offerings, and how often you like to check in with clients, there might be a lot of standard emails to document. Take a few weeks to get this done. Don’t rush — do it right. You now have your “General” file — a super solid foundation for any general business communication you need to send out. 2. Create your “Programs” file. Whatever services you offer in your business, you undoubtedly have to communicate about them over and over. Write (or paste in from programs you’ve already written) and save into this document. Here again, this task might take some time, especially if you’re writing programs and questionnaires from scratch. These resources will pay you back for your time, trust me. This is now your “Programs” file, from which you can pull any time you need to communicate what to do to your clients (or what your business offers to prospective clients). 3. Create your “Emails” file. Which emails are virtually the same? In a new document, make a list of your email categories. Under each category heading, paste in your best email on the topic, and tweak/perfect it as necessary. Save it. This is your “Emails” file, which you can refer to whenever you need to communicate with a client (or prospective client) via email. 4. Create your Master Folder. Save your “General”, “Programs”, and “Emails” files in one folder that is handy for you to access. Now, you will have a master database of all of the most common things you need to share with your clients. You can pull from them when you reply to questions or you proactively send messages to your clients. You just saved yourself thousands of hours. By the time you pull information from your Master Folder and paste it into a new document or body of an email, you’re 90 percent done. The other 10 percent? Customizing for the specific client or prospect you’re communicating with. Start with a friendly greeting and a sentence or two about how they’re doing, what they’ve been up to, etc. Now, personalize your answer or information based on the client or prospect’s specific question. Sign and send. All set. Put your saved time toward “time warriors” (and a long-awaited vacation). The thousands of hours you just saved? Some of them get delivered straight to your personal life. Spend some time with your kids, take yourself on vacation. Also trying to grow your business? Now’s your chance. Put a lot of the “gained” hours toward high-value tasks — i.e. your “time warriors”. Remember, these are the tasks that 1) you love doing and are uniquely good at, 2) can’t be automated, 3) have a tangible impact on your business and earnings. That could include spending one-on-one time with clients in a much more targeted way (i.e. ONLY to work on the lift they’ve been struggling with or ONLY to help them find a solution to their I-don’t-have-time-to-cook problem). Or it could be lead nurturing. Or highly targeted marketing. Or running group coaching sessions. Or working on a certification. In the end, here’s a critical, often-missed point: A time-management system based on automation allows you to be more personal. If you can automate the universal material, then you have more time to engage with people by listening, understanding, customizing advice, and interacting. You are you, and your business is your business. I can share the strategies that worked for me and for Precision Nutrition, but you get to pick what’s best for you. If you’re feeling overwhelmed, start here. Stop saying “if only I had more time” and start taking command of your time. Review your tasks and assess which ones are “time wasters” and which ones are “time warriors”. Consider: How can you free yourself up to do more of what is most important? How can you use systems to do less of what is not important? 2. Stop working harder. Start working smarter. Systems were invented to smooth and streamline processes, and take busywork off your plate. Try the PN motto: “Never repeat yourself”. If there’s something you do more than once, you can probably automate it or make it more efficient somehow. Get stuff out of your mind, off the Post-it notes, and into a program that will do the work of organizing and remembering for you. Become vigilant: Every time you do something that you know you’ll have to repeat later, capture it in Word or a Google document. Keep that file handy so you can copy-and-paste it next time you need it. Meanwhile, if you have existing systems, evaluate them. What’s working well? Which ones do you trust most, and why? Aim to do a little more of what’s already working. 3. Make sure your efforts align with the life you want. If the genie jumps out of the bottle and you finally get the free time you’ve been wishing for, what will you do with it? Will you use it for the certification you want to get? Upgrade your web presence? Have more personalized exchanges with your clients? Or spend quality time with your family? Know what you want your time for. Then be deliberate and intentional about how you use it.